Clean And Clear, For Years And Years! WonderGlass™ is a durable field-applied treatment for all glass surfaces, including architectural glass and windows. When applied to glass, the product fills any minor imperfections renewing the appearance of the surface, creating an impermeable barrier to water, solvents and pollutants found in the air. The treated glass surface will require little to no maintenance and will appear new for many years. If cleaning is needed, just spray with water and the surface is clean and clear again. WonderGlass™ is water soluble and safe for the environment. When applied, the product bonds to the surface, locking onto and becoming part of the glass. Because the product is engineered using nano-particle chemistry, the application of WonderGlass™ creates a hydrophobic and lyophobic surface that is actually harder and more resilient than the glass it is applied to. WonderGlass™ is 100% clear and leaves no tint. 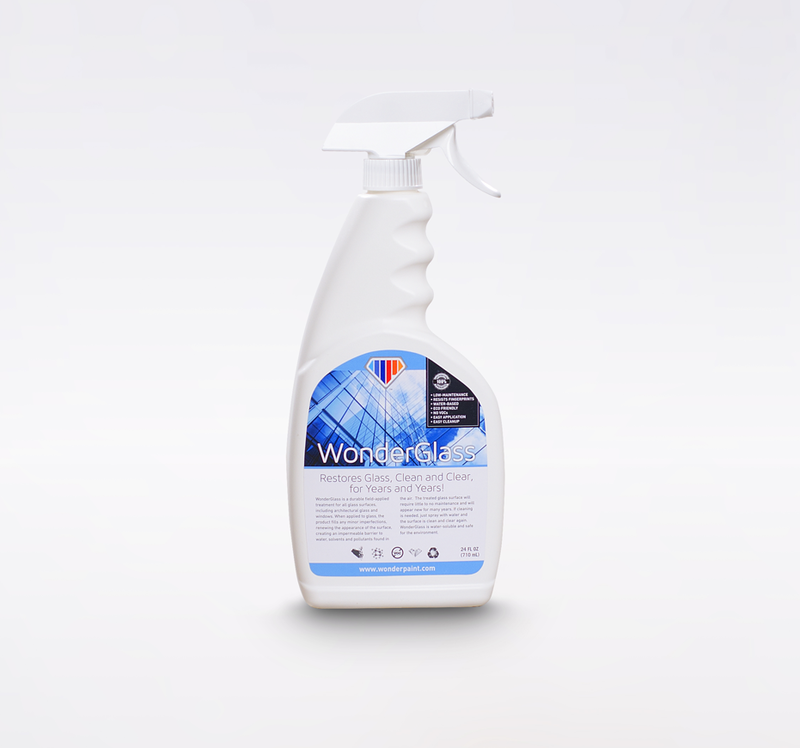 100% SATISFACTION GUARANTEED WonderGlass™ is tested to keep windows clean for years and years. When properly applied, it creates an impermeable barrier to water, solvents, dust, dirt and pollutants. RENEWS & RESTORES WonderGlass™ renews the appearance of glass, filling minor scratches and imperfections as the product chemically bonds to the surface, providing a 100% transparent and durable coating that restores the appearance of glass for years to come. ENVIRONMENTALLY FRIENDLY WonderGlass™ is environmentally friendly, non-toxic, readily biodegradable, non-flammable, VOC free and safe for the environment. ANTI-FUNGAL, ANTI-MICROBIAL WonderGlass™ contains ingredients that make it impossible for mold or mildew to form once the product has been applied and cured. WATER-BASED - EASY APPLICATION & CLEANUP WonderGlass™ is water-based and easy to apply and clean up. Because the product is environmentally friendly, clean using ordinary soap and water.